Finding something fresh and fun to do on any ole date night can be difficult as is, but Valentine’s Day puts on 10x the pressure. You want to show your affection, your way and on your budget – but where to start? The guide below should be helpful! These tips for relationships of all shapes, sizes and styles – and even singles! Slip away and pretend you’re in a distant European city at District Provisions, on Wayne Avenue, not far from the Oregon District. This collection of connected spaces in the Dietz Block has become a decadent destination spot for foodies. Any of the three current purveyors would be a perfect place to get food & drink before or after any of the other events and performance listed later this week. 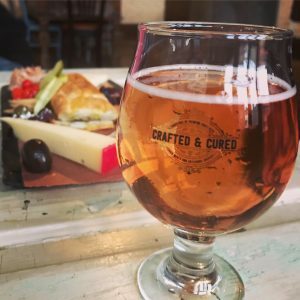 Crafted & Cured is the anchor of District Provisions, boasting a 60 tap system with unique and rare beer, ciders, and meads. The cured element delivers charcuterie boards with truly delectable meats, cheese, oils, vinegars, fruits, vegetables and select seafood to culture your palette. The beautiful Glasz Bleu Oven restaurant features wood-fired dishes created before your eyes. They pride themselves on using the very freshest local, organic ingredients. Jack Lukey’s Oyster Saloon & Caviar Bar is a cozy and elegant little spot. Oysters have a reputation for being an aphrodisiac, so you’ll certainly get in the mood there! In the same area along Wayne, another decadent spot to check out is the new Van Buren Room. This is an old school, dark swanky bar that’s connected to the Belle of Dayton Distillery. Here is where you can grab a yummy craft cocktail. Ladies, if you forgot a present for your man, smoothly buy a bottle of their vodka, gin or rum along with a custom glass or t-shirt. Another place to grab custom cocktails and the best bourbon, is of course further downtown at the Century Bar. A classic for good reason! This week you can also catch the touring performance of The King & I, the classic Rogers & Hammerstein musical of an unconventional love story. Nothing like stepping foot in the gorgeous Schuster Center to make your heart swell! Performances: Tuesday-Friday at 8pm, Saturday at 2pm and 8pm, Sunday at 2pm and 7:30pm. Runtime 2 hours 32 min plus 15 min intermission. Tickets start at $26 (Plus service fees. Prices subject to change. Military discount available. Get tickets online at TicketCenterStage.com, at the Box Office, or by phone at 937-228-3630 or 888-228-3630. Perhaps you’ve recently met someone interesting, but don’t feel it’s serious enough to do a super romantic Valentine’s Day dinner. Or maybe you’re old sweethearts, seeking an option that is casual and interesting. Either way, I think you’ll enjoy a short film that is debuting on Wednesday evening. It’s budget friendly too! 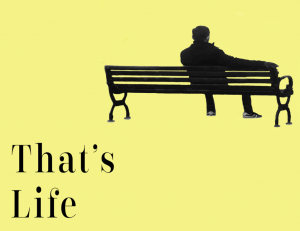 “That’s Life” is the creation of an 18 year old Dayon-based filmmaker, Christian Gentry. The trailer for this film is surprisingly mature, centering about an aging, out-of-touch musician who tries to save his dating life with a young woman he meets in the city. Sounds fun for a date night! Film starts at 7:30pm at Neon Movies. $7 tickets in advance. Fun side note: Neon serves both coffee and cocktails, among the other traditional movie theatre munchies. Before or after the debut, you can grab dinner close by in the Oregon District, at any number of places such as Blind Bob’s, Lucky’s Tap Room, Oregon Express, Dublin Pub, Troll Pub; or a bit more upscale at Roost Modern Italian, Lily’s Bistro, Corner Kitchen, Thai 9, Jay’s Seafood, Wheat Penny around the corner or at the aforementioned locations. Checking ahead and making reservations is always recommended! All right. It’s Valentine’s Day and you don’t have anything for your sweetie. Pop out at lunch and grab flowers at the Second Street Market’s Flower Man. 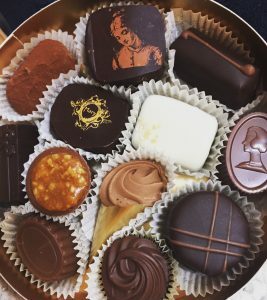 Or stop by the shops in Oakwood, and splurge on a gorgeous box of chocolates at Madame Delluc (2510 Far Hills Ave). This is one of two places in the United States that you can buy true Belgian chocolates from the one and only Royal Warrant Holder. Pop into Arrow Wines or Dorothy Lane Market for bottle of wine, and you’re all set! Valentine’s Day is a perfect reason to support and enjoy the wonderful arts organizations we have in Dayton! Thursday evening is opening night for the Dayton Ballet’s run of Perspectives. This is a repertory show, which in layman’s terms means not a story ballet. There will be 4 shorts, often more on the modern side, where the music, costumes and styles change with each piece. Makes it perfect for people who are new to dance performances – especially for the romantics out there. Two of these ballets will make their world premieres on the historic Victoria Theatre stage, in keeping with Dayton Ballet’s international acclaim as “The Company of Premieres.” Love that! The performance starts on Thursday at 7:30pm. Additional performances this week: Friday 8pm; Saturday 8pm; Sunday 3pm. There are so many new places to grab a bite to eat before or after the show, within walking distance in the Theatre District downtown. Hannah’s (located next to the Arts Garage on Ludlow) is hosting the Dayton Ballet Barre’s pre-performance reception at 6pm on Thursday. Bar Granada has recently opened on Monument, and is perfect for shareable tapas and wines. Carmen’s Deli has recently extended their dining hours, and is quite close by in the Kettering Tower. Or make dinner reservations at the The Racquet Club, Table 33, Mudlick Taphouse or Uno’s Pizza. More of a visual arts and wine aficionado? The Dayton Art Institute invites you to celebrate 100 years of love, service and partnership the museum has provided to the community with a Valentine’s Day wine and chocolate tasting. The Vine & Canvas event includes a guided museum experience focusing on the museum’s centennial. Advance tickets are $35 for museum members, $45 for non-members. All tickets purchased the night of a tasting (as available) are $50. The event runs from 6:30-9pm. Cheers! Working during the week, and can’t celebrate till the weekend? Never fear – there are even more options! Check the cultural box with Erin Smith-GlennExhibit Closing Show at Mikee Huber’s lovely gallery located at 903 N. Keowee Street from 6-8:30pm. In addition, there will be wine & refreshments, and special offers and giveaways! Ready to de-stress? Laughing always helps! I checked out Black Box Improv recently, and I could not get over how funny it was! Our cheeks were hurting from laughing so much! On Friday there will be two improvised musicals with Trey Stone & The Black Box Band on both Friday and Saturday nights. Bring your favorite alcoholic beverage and get in the mood! Doors open at 7:30pm, Show at 8pm. $12 tickets at the door or online. First come, first serve, so I find it’s best to reserve ahead. Single? Well there’s no reason to be depressed this weekend! Head over to The Single Mingle at Hannah’s. They’ve got a DJ lined up, great food, craft cocktails and lots of great connections for those who are ready to meet someone special. Starts at 9pm. Also tip for the singles – any of the next music shows are great places to meet too! Music fans have a couple great shows on Friday. 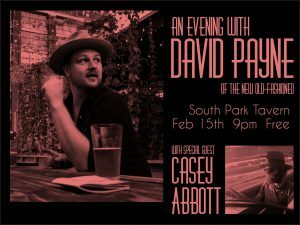 Over at South Park Tavern, you can get cozy and casual at An Evening with David Payne. The local Americana folk rocker is known from his band The New Old-Fashioned. Special guest Casey Abbott kicks off the evening of music at 9pm. Best part? No cover charge! 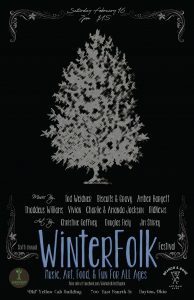 There is more for music fans on Saturday night with the rescheduled Winterfolk Festival at Yellow Cab Tavern. It’s going to be a non-stop night of music and visual art for all ages. Harvest Mobile Cuisine, with its farm-fresh comfort food, will be on hand to fill your belly. The YC Tavern offers craft beer & cocktails are available to those 21 & up with proper ID. All ages allowed in for the fun and music! Doors 7pm. Show 8pm. Tickets will be cash sale at the door for $15. Cap your weekend off with brunch for a very good cause with Savor Your Sundays! 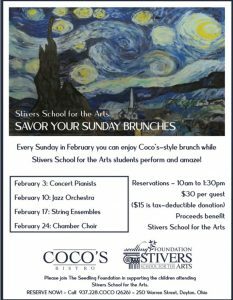 Every Sunday in February, you can enjoy a specially curated brunch menu of delicious entrees at CoCo’s Bistro benefitting Stivers School for the Arts! The brunch also features talented performing arts students from the various music magnets. You absolutely must call ahead as this is a limited seating. Call 937.228.COCO (2626) to reserve your spot for this Sunday or the next one. Just 2 left! Lastly, please remember to check out my weekly live original music run downs here. You can bookmark and check weekly! Also follow my Dayton music and events @thevenuschild on Twitter or @venuschildproductions on Facebook; @venuschild on Instagram. I have some fun music events coming up you won’t to miss! Thanks for dating your city!